Our friends down at the Northwest Indiana Times have posted a bit about our performance at the Design Harvest Festival on October 2.Â The article is in the movies section.Â We think that’s because there’s a lot of visual elements to our show. For country music fans whose taste runs along the lines of Waylon, Willie and Williams Sr., rather than Sugarland and Swift, Chicago’s Hoyle Brothers are worth seeking out. The Hoyle Brothers got some props from a listener after a recent Empty Bottle gig. Â Read the full blog post here. The Hoyle Brothers honky tonk happy hour: a packed room with $2.50 Shiner Bock on special and a dance instructor giving two step lessons.Â Exactly the scene you expect.Â Purely joyous, from a band thatâ€™s been doing this long enough they donâ€™t have anything to prove.Â A drummer singing harmonies who knows the difference between a swing beat and a honky tonk stomp, a guitarist who can soar like a fiddle or snarl like a tenor sax, and a singer with the kind of smoothness that can put anything across. Laced with sublime pedal steel guitar, the Hoyles do honky tonk as well as honky tonk can be done, gamely entertaining requests from fans, mixing classic country covers with their own material, giving a lesson in western swing dancing, and providing a fine soundtrack for unwinding at the start of the weekend. The Hoyle Brothers shared the stage with Robbie Fulks at the Hideout on April 5.Â The show featured a selection of obscure country & western tunes from the 1970s.Â A good time was had by all! Remember that hilarious scene in “The Blues Brothers,” in which the bar owner’s wife says about musical variety: “We have countryÂ andÂ western.” That’s the Hoyles. And they’re local. They’re still doing their thing at the Empty Bottle, as one of the most reliably excellent free nights of music that you’ll find. The musicianship is exceptional, and the presentation is sincere. 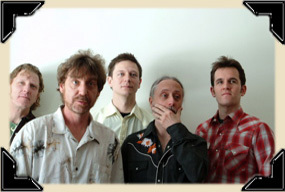 These guys believe in honky-tonk music, and sound like it. It’s authentic but not empty, like so many bands trying to capitalize on things such as swing or rockabilly trends. These cats probably honky tonk for fun, and you need to hear them. Though an open-ended weekly gig is good steady work, it makes it easy for audiences to take a band for granted. Chicago’s Hoyle Brothers have been slinging no-nonsense old-school honky-tonk 52 times a year (or close to it) since 2002â€”first at the Hideout and then at the Empty Bottle, where for a spell they played not just every Friday but every Sundayâ€”but sometimes I wish it were harder to see them, if only so more people might treat them like something special. Last spring they put out their third self-released album, Don’t Leave Yet, a collection of sturdy original tunes (and a cover of Waylon Jennings’s “Anita, You’re Dreaming”) whose crisp, twangy grooves are embellished by liquid pedal steel and woozy Dobro. Their sound reminds me a bit of the early output of Nashville’s BR549, from before their headlong lunge at the mainstream, and though the Hoyles’ own material would be DOA in Music City, it does just fine as the soundtrack for a happy hour at the end of the work week. The best thing about the holidays is that nobody wants to go anywhere. Bands don’t tour very much, you want to hang with family and it’s cold anyway. This means that local rules. This city is in possession of a treasure, one that you should feel guilty for not having indulged in (unless you already have): The Hoyle Brothers. It will be eight years that this quintet (not brothers, by the by) has been doing its honky-tonk thing at the Empty Bottle. And you know what? It’s still free. As in no money. As in you should be ashamed of yourself for not going â€” because it’s free. But even if it weren’t free, you should be ashamed of yourself for not going, because one thing that a city needs to do is supports its local arts gems â€” like the Hoyle Brothers. For the unfamiliar, honky-tonk isÂ country music, but with an unassailable purity that the Hoyles have mastered. No pop stuff, no slick sport-utility vehicles, just twang. The group â€” Lance Helgeson, Steve Doyle, Brian Wilkie, Josh Piet, Trevor McSpadden â€” has a record that came out in 2009, “Don’t Leave Yet,” that is its best one yet. You get more of a taste of what the group is like in the live setting, the pace, drive and swing that make everyone who talks about this band use the same word: real. Best of all, you have no excuses. It’s the holidays, you’re tapped out thanks to Christmas and booze, so you’re probably looking for something really cool to do. So fire up the computer, and get a little Hoyle sample, at myspace.com/thehoylebrothers. It will take care of your last excuse for not hearing this band’s beautifully played, butter-smooth country that goes down like one of those preternaturally tasty pedal steel licks from Wilkie. We should warn you: If your idea of country is that pop stuff, leave those perceptions at home. Now go have fun. The Hoyle Brothers â€“ True honky tonk country. Covers and originals. 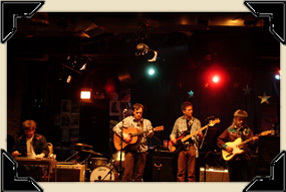 They play Happy Hour every Friday at the Empty Bottle from 5:30 â€“ 7:30. I always being my Texas friends and they always give a seal of approval. And you can request songs they donâ€™t play and theyâ€™ll give it a go. â€œStreets of Bakerfieldsâ€ for example. Twice. Nice guys too. Rock for Kids and The Hoyle Brothers have teamed up to promote music education among Chicagoâ€™s underserved children with the release of The Hoyle Brothersâ€™ â€œHome For The Holidaysâ€ EP. Through the partnership, The Hoyle Brothers will donate 75 percent of the proceeds from online downloads of â€œHome For The Holidaysâ€ songs to Rock For Kids through December 31, 2009. The donation amounts to 53 cents for individual tracks (75 percent of the 70 cents the band receives. The remaining portion goes to online distributor, CD Baby, for hosting expenses). The three-song holiday EP is available for downloads atÂ CD Baby. A couple of months back, The Hoyle Brothers recorded a few holiday-themed tunes in preparation for this Christmas season.Â We tracked a snappy little shuffle of Stevie’s called “The Only Thing I Want For Christmas.”Â Once we heard the playback, we knew it was a sure-fire winner.Â The song has gone on to become a finalist in the Chicago Tribune’s “New Holiday Classics” contest. Â So hit the Tribune’s website and vote for us!Â We are #8 on the ballot.Â Make sure to give the tune a listen through the YouTube video on their page.Â It’s a sweet little song and we hope you dig it.Â If you’re so inclined, please spread the word! The Hoyle Brothers are a learned bunch of musicians, and on Fridays they go interdisciplinary with a happy-hour residency at the Empty Bottle. Listen (and drink, of course) as the Chicago natives break out the steel-guitar lines to pay their respects to country kings Hank Williams and Ray Price. This twangy two-steppin’ heartbreak is available weekly, free of charge. Our new record is out and the reviews are very positive!Â Take a look at this one… it’s the first time we’ve received a review that used the word “defecating.”Â We’re pretty sure it’s meant in a good way. Take a look at this recent blog post.Â Itâ€™s a good overview of country musicâ€™s history in Chicago, as well as a nice plug for our Friday shows.Â Weâ€™re pleased to be doing our part in keeping country music alive in the big city! Here’s a nice write-up from a blogger that feels lucky the Hoyle Brothers are providing Chicago with quality entertainment every Friday.Â We hope you agree!